← Thanks again for Hoppin in!! What is the difference between imported Green peafowl and American Green peafowl?? The short answer is that our imported Green peafowl are direct imports, or offspring of direct imports, from a world renowned breeder in Germany and our American Green peafowl are our collection of Green peafowl acquired from various breeders here in the U.S. We breed these birds as two very different groups of birds. We also sell these birds as two very different groups of birds. We believe the imported birds are the purest Green peafowl available in the U.S. Their ancestry can be traced back to imported birds from S.E. Asia. I have yet to find any Green peafowl in the U.S., other than our imported birds, that can actually be traced back to imported birds from S.E. Asia. Obviously, there were Green peafowl brought into the U.S. at some point in our history but, records that trace their lineage back to imports from S.E. Asia do not exist. This does not mean that Green peafowl that have been kept in America for the past 40 years are not pure……but it definitely decreases the likelihood that they are! 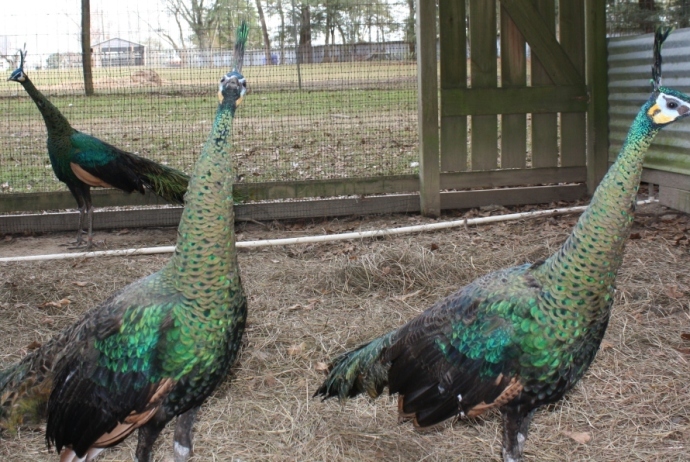 There are not many, if any, breeders in the U.S. that have kept a flock of Green peafowl for the past 40 years. This means that everyone who currently owns Green peafowl in the U.S. bought their Green peafowl from “someone else”, who also bought their Green peafowl from “someone else”, who bought their Green peafowl from “someone else.” People can, and do, unintentionally breed Green looking Spaldings (hybrid) year after year and label and sell them as pure Green peafowl. Most people do not have the intention to mislead their customers….they are just selling their birds as Green peafowl because they bought them from “someone else” that sold them as Green peafowl. During the course of the last 40 years it is very likely that somewhere along the way most Green peafowl were paired with Green looking peafowl and as a result populated the U.S. with really nice Spalding (hybrid) birds, but ultimately decreased the population of pure Green peafowl. When we set out to breed the highest quality of Green peafowl in the U.S. we spent a great deal of time researching the breeding history of Green peafowl in the U.S. We contacted anyone and everyone we could find that had knowledge of the history of Green peafowl. While doing the research we purchased many Green peafowl that were said to be pure. Some looked great…and some looked not so great. It was very difficult to judge the appearance of the Green peafowl because we had nothing to compare them to. So, we imported Green peafowl from Wolfgang in Germany in 2005 and again in 2007. Those birds have provided us a model to compare Green peafowl here in the U.S. to. Since then we have carefully chosen what we feel are the best looking Green peafowl found in the U.S. We only select Green peafowl that look like Pavo-muticus muticus green peafowl. They are carefully chosen based on their history and/or their phenotype (physical appearance). We label them, breed them and sell them as American Green peafowl. But, we are dedicated to only breeding (American) Green peafowl that we feel are consistent with the wild type Pavo-muticus muticus peafowl.